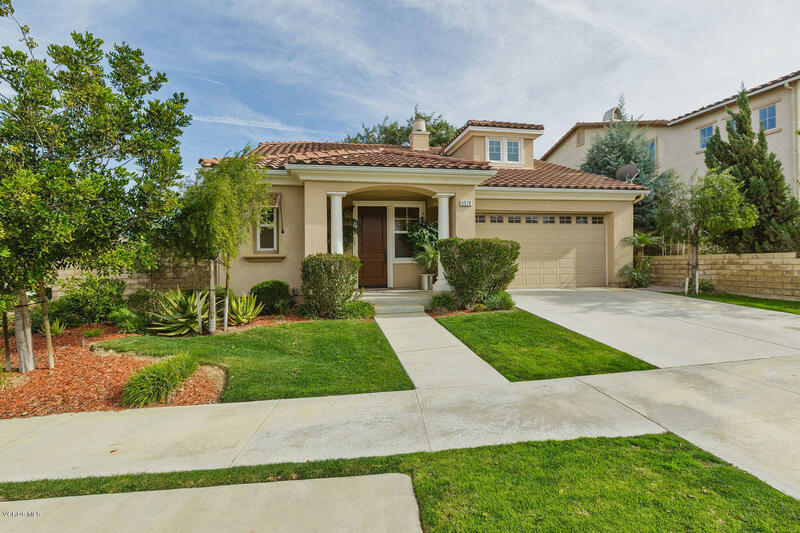 Looking to live in the gated community of Moorpark Highlands? Come see this beautiful corner lot, impeccably maintained by original owners. Home features a completely upgraded 2, 113 sq. ft, 3 bedroom, 2.5 bath open floor plan with family room, eat-in kitchen & formal dining room that can double as an office or be converted to a 4th bedroom. The kitchen offers premium Blue Pearl granite countertops from Italy, wood cabinets, matching GE appliances, a center island with breakfast bar, walk-in pantry and a built-in 16 stage drinking water purification system. Italian ceramic tile flooring, plush stain resistant carpeting & 3 wood blinds throughout. Indoor laundry room. Large master suite has a jet spa tub with mounted flat screen TV, oversized shower, black granite, his & hers vanity and walk-in in closet. Additional 2 bedrooms have full jack and jill bathroom with white marble countertops. Walk-in attic access for additional storage. The private backyard has been finished with $22, 000worth of landscaping & stamped concrete. Community features 2 pools & spas, 7-acre park with tennis & basketball courts, soccer field, children's play area, and a gated area for BBQing/parties. Close to schools, shopping, restaurants, freeways & access to Metrolink & Amtrak.